JAJ Construction Masters Replacement of 13 foot x 6 foot windows. JAJ Construction Masters Replacement of 13 foot x 6 foot windows. 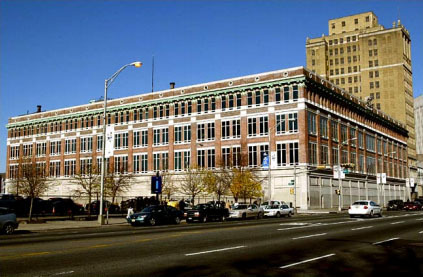 SPECIAL TO DOOR AND WINDOW BUSINESS- June 1, 2015 developers and financing partners joined Newark, New Jersey city officials to break ground on the $174 million restoration of the Hahne & Co. building – longtime historic landmark on Broad Street, NEWARK, NJ but years neglected. The project calls for rehabilitating and converting the Hahne’s department store into 160 mixed-income housing units, 75,000 square feet of street-level retail space and a new arts and cultural center for Rutgers University. The retail portion includes a 30,000- square-foot Whole Foods, a high-profile tenant that’s expected to bring new traffic to Broad Street. For Newark, the project will reactivate one of its most iconic structures as part of a surge in development around it. The development team is preserving key elements of the four-story, 400,000-square-foot building, including the façade, the original signage and the skylight. As a national historic landmark, the building falls under the authority of the National Parks Service, and the sight lines of the new windows needed to match the existing windows within 1⁄4 inch. The project is the result of an unusual collaboration by a long list of partners, including L+M Development Partners, a development company that specializes in mixed-income housing and community improvement projects; Prudential Insurance Co., one of downtown Newark’s biggest corporate cheerleaders; Rutgers University; financial institutions Goldman Sachs & Co. and Citigroup; and a number of municipal and state agencies. Turner Construction Company is the General Contractor. Whole Foods’ commitment to open a store on the site also played a key role in getting bank and governmental backing for the $174 million project. The project also received up to $40 million in residential and commercial tax credits from the state Economic Development Authority. The project itself isn’t the only thing that’s “big”. The windows themselves are massive: 13 feet tall and 6 feet wide and weighing in at over 600 pounds. Because the building is categorized as an historical landmark, windows had to be found that matched the original architectural look of the old wood windows but be modern enough to offer the energy efficiency that a building like this now requires. 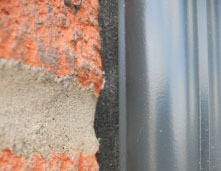 Stu Erling, president of JAJ Construction, the company awarded the contract to handle the removal and replacement of all the windows in the complex, as well as installing the new windows being included in the newer parts of the project, needed to find the right manufacturer for these custom. The project decided on working with Universal Window and Door at 303 Mechanic St, Marlborough, MA 01752. Universal has long prided themselves on the design and manufacture of customized windows that restore the original splendor of historic buildings while combining modern energy efficiency technology. (http://www.universalwindow.com/) The windows that were chosen were made special for the project out of aluminum with insulating glass, and are placed into a special panning system attached to the old openings, careful to maintain the old look, but using modern materials from Hanno in Germany who supplied a special joint sealing tape (BG-1) that conformed to the existing brick, and required no external sealant to interfere with the look. (http://www.hanno-vito.com) Quad Foam from OSI (http://www.OSI.com)is used to fill the header and jamb gaps, and a GE Sealant finished the inside joint. Due to the size and weight of the windows (numbering more than 400 for the total project) and the precision necessary to place them in the openings from the inside, lifting and handling of the windows was a problem. 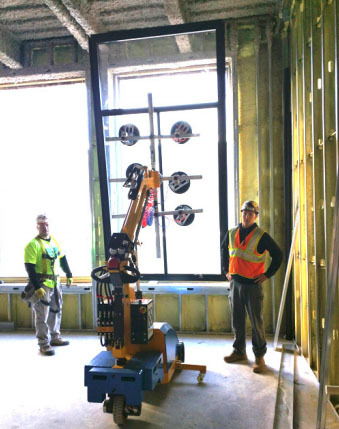 “Big cranes needed to place them on each floor from the outside, but there was no way to have these cranes set the windows in the openings with much effort and safety issues” Mr. Erling told us. “I found a company in Australia, Quattrolifts (http:/www.quattrolifts.com) who make a lift machine called the Vector that is designed to unload, transport and install large plates of glass with extreme precision. It has a lifting capacity of 400 Kg’s (880 Lbs) with a dual vacuum system designed for performance. This capacity made it perfect for the large windows on our job. We pick them up horizontal, move to the opening and rotate them to vertical. One man can guide the window into position, and two helpers make the final adjustments to position and fasten the window perfectly,” according to Mr. Erling, who along with his crew is Certified Installers through AWDI’s Certified Window Fitters Guild Program. JAJ Construction has also been contracted to replicate the existing storefront on the building with some glass lites as large as 100 square feet. Big windows are just part of their everyday work.